It seems only fair to share some samples of the gorgeous computer generated art I was raving about in the previous post. Whether it’s a photo-real moonlit beach or a stage full of wooden marionette puppets, these beautiful digital environments practically beg to be explored and enjoyed. Would you like to know the – tenth, let’s say tenth – thing I realized right after awakening? Within a few minutes, literally, I recognized that computer gaming would never again hold for me the same importance that it had until that moment. This thought brought a feeling of loss because I lloooooove me some computer gaming, so much so that in 2016 I spent a considerable number of my pennies on a computer hardware upgrade (which I actually took pics of in true geek fashion) so I could jump onboard the VR (virtual reality) bandwagon. My super happy plan in late-2016 was to finish a project management contract and take a 3-month break from work to slip off the planet into the worlds of cyberspace. Then the awakening happened and all those plans ceased to exist. After awakening and then spending months pushing through my outdated notions of what it means to be spiritual, I came to point where I recognized that my next challenge would be to come back to the world without getting lost in it. Though I was no longer clear on what specific work I’d be doing in the future, I was clear in my understanding that I should not withdraw from the material ‘noise’ of the world but should engage with it on a creative level. I felt called to resurrect my longstanding and long-neglected interest in artistic creation and to marry that with the skills I had acquired professionally over the years and see what happened. And if this approach seems a little cavalier, blame that on the spiritual teachers who encouraged me to indulge in such recklessness(!). It turns out that many who awaken are left facing the challenge of finding a new purpose in life, one that feels more true to the newly revealed self. In response to those asking for help in finding this purpose, many teachers advise two things – patience and engaging in the act of creating. Patience makes the time for a practice to develop, bringing the stillness that carries insight. Acts of imagination and creation hook us into the mainline of Source consciousness, the wellspring of all inspiration. Whether through singing, painting, writing – any act of creating is recommended as a way to help quiet the egoic mind and invite inspiration and insight; I’ll share some of these teachings in the next gallery. Heeding this advice while remaining cautious of becoming distracted by material forms, I started small with a strange little beading project that came to mind one day. Then I did a little writing, some adult coloring (ha! ), started listening to some new music – all the while trying to stay mindful and aware, not grasping for more or distracted from the path by the play. And it was like a long drink of cool water for a parched egoic psyche, a welcome relief from holding a constant wariness against the lure of identifying with form. It was the balance that had been missing in the months following the awakening ~ because all work and no play make for a slightly boring awakening. Encouraged by these experiences with creating little works of art, I decided to revisit one of my favorite forms of art – computer games (yes, I know that ‘art’ statement is a controversial one; more on that later). Truthfully, I was nursing an ailing feline companion (discussed here) at the time and was looking for a way to access some ‘up’ energy and playing a game felt like just what the doctor ordered. First I revisited a simple iOS game for some fun puzzling then spent a few days on a short adventure game from my overflowing Steam library. And honestly, it felt like the mindful approach paid off in that I was able to enjoy the play – solving puzzles! beautiful environments! weird noises! – without being distracted by it when not playing. And through an expanded awareness, the art and stories of the games gained new layers of meaning in recognition of the Source consciousness that informs all artists; is it a coincidence that our computer games, like our movies and books, are increasingly exploring the notion of consciousness and the nature of reality? To my mind, it seems technology was custom made to explore these topics (likely reflecting the psychedelic / sci-fi aspect of how my mind works). And now the mobile apps are showing up in droves – biohacking, biofeedback, task-optimized music, binaural beats – making it clear technology will be yet another tool with which we explore inner space. Life is meant to be joyous – or so I hear from nondual teachers as they patiently remind the frustrated seekers before them, myself included, not to take this life too seriously. A few even go a bit further, shouting “lighten up already!”. And I get it; altered states of awareness have brought me glimpses of the boundless joy and peace that is at my core. In rediscovering an appreciation for computer gaming, I’ve reconnected with a way for this mind to experience more of life’s joy – the joy of play! And when I’m not getting just a wee bit frustrated by my bazillionth unsuccessful attempt to solve a puzzle which is clearly! impossible!! to solve!! !, then I’m reveling in the incredible works of the innumerable artists who are filling cyberspace with their wonderous creations, much like awareness fills itself with wonderous experience. Absolutely everyone’s 2012 game of the year, this gorgeous single player (dual player optional) game has you beginning your journey at the top of a sand dune in a windswept and practically empty landscape. As you listen to the evocative soundtrack (cellos!) and leisurely explore the landscape, you begin to acquire a simple skill that allows you to progress towards the goal while learning the story of the place as told through hieroglyphs scattered among the ruins. As you move through the game, you will observe other players making the same journey and can chose at various points to journey with another player – but only one – which is made challenging by the fact that you both can only make a single chime sound/symbol. The simple yet beautiful environment, music and game play allow the player to focus on the journey and the emotions is evokes, all of which combine to make this game a milestone in the industry. Practically anything by the folks at Amanita Design gaming studios is a visual treat but this game follows a bit more of the traditional gaming mechanic than some of their others. As the game progresses you take on the role of five different creatures who are attempting to save their tree from parasite invaders. Each character has to figure out how to solve the only slightly challenging puzzles by helping out the other creatures that live on the tree, which brings health to the tree. The folks at Amanita rely again on items from nature blown up large to create or inspire the funky and charming backgrounds and there are many little touches of the surreal for added amusement. Throw in the usual mix of delightful mouth-noises sound effects and musical accents you get a short but clever and gorgeous little adventure about bringing nature back into balance. If the thought of confronting brain-bending puzzles in a quite setting while pondering unusual visual and audio clues about the meaning of life grabs your attention, then this is your game. You begin by emerging (being born?) from a tunnel onto an small island filled with multiple ecosystems in which you encounter numerous line puzzles which become increasingly difficult to solve. Digital voice recorders found around the island give you some philosophical clues about the journey you’re on, as do the sculptures (and their shadows) found tucked away in various spots. The mind that easily sees patterns in the world will find this a fun test of the powers of observation. The beautiful surroundings, ambient background noises – and the fact you don’t have to solve all 523(!) delicious puzzles to complete the game – make this title accessible for anyone looking for many hours of mental play. And bonus points to the game for its interesting connection to well-known spiritual teacher, Rupert Spira. If recommending fiendishly difficult puzzles solved at leisure in beautiful environments, I must include Myst and its sequels, Riven, Exile, Revelation, End of Ages, and Uru. The game begins with finding a mysterious book which transports you to lush worlds full of intricate machines, mazes, puzzles and a story line that requires the player to notice and narrate the visual and audio clues disguised in the environment, sometimes in maddening ways. The original game, Myst, set a high water mark for gaming graphics and the folks at Cyan studios have been keen to build on that reputation in all their sequels; they’re all gorgeous! Nor has any expense been spared on the audio as all games include impeccable sound effects and lush musical soundtracks. A story of family dysfunction (understatement) and visual clues to past violence are the only darker elements in this otherwise peaceful – if challenging – series of adventure games. And good news for Myst fans; Cyan studios have successfully Kickstarted a project to update all their games to run on the Windows10 platform. Yay! If casual puzzles in simple spaces are more your thing, the mobile gaming world has countless options. Thankfully, various websites sort through the thousands of games released each week (day?) to alert us when an especially good casual puzzler comes along. This two-game series started making waves back in 2014 and the much-anticipated sequel came out June 2017. In each game, you help a mother and daughter make their way through a series of Escher-like structures that challenge the player to see structures in more ways than one. These short games combine clean graphics, simple mechanics and a meditative soundtrack to provide an experience that soothes the psyche with a lovely environment while challenging the mind with clever puzzles. Full disclosure, I have only played enough of this game to make sure it was going to be what I was hoping it was going to be – a meditative dive in beautiful ocean environments with a few interesting puzzles to let the mind play. Scored by Austin Wintory (Journey), the soundtrack brings a lushness to the simplified visuals (we’re not going for hyper-real here) to create an environment that invites exploration just for the sake of hanging out in the space. The objective of the game is simple – finding magical springs to restore life to the ocean – and completing the game takes just a few hours. But this is a game where it’s more about the journey than the destination. The brilliant folks at Czech gaming studio Amanita Design (mushrooms?!) always delight the eye with their unique style of combining inanimate and animate objects to create whimsical and trippy environments. Add a funky soundtrack full of charming mouth-generated sound and musical effects, clever puzzles and a button-cute avatar and you’re in for a few hours of chillaxing fun. Each of the these short games challenges you to use objects in unusual and amusing ways as you restore balance to the lives of the creatures inhabiting this small world of objects orbiting in space. The games all have an amusing Zen about them that makes me think the name of their studio is no accident. 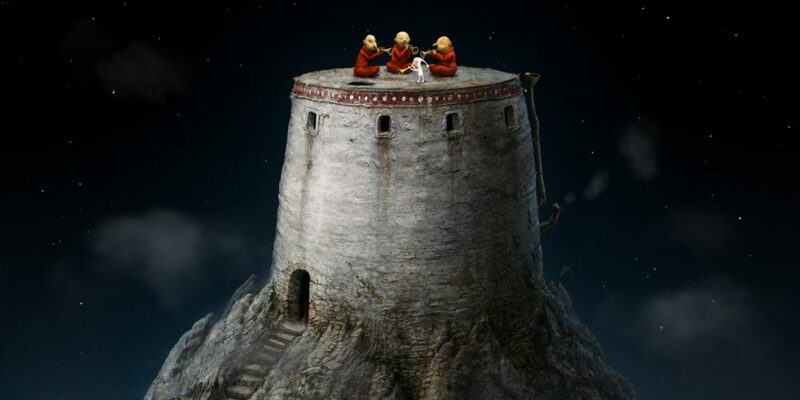 For example, feast your eyes on the groovy picture featured at the top of this post, in which the avatar is playing a jazzy tune with three fellow monks. (Spoiler alert) This scene is from the end credits of Samorost 3, making this one of the cooler end-games I’ve experienced lately; click here to listen to the lovely little tune that’s playing and catch a glimpse of the game in motion. And if you prefer your gaming with few goals other than hanging out in beautifully rendered digital environments, check out these meditative titles. Start as a small shape and merge with larger shapes; flow into the deep as your form grows in size. You are the wind and you make the flowers bloom. (PlayStation only) You are a pair of forms that travel tunnels of energy, allowing the two to become one. Fun soundtrack. (PlayStation only) You are a long form exploring many other forms that do many interesting and amusing things. Excellent soundtrack.